Apple(s aapl) launched a less-expensive iPhone 5c handset in various parts of the European Union on Tuesday, 9to5Mac reports. The phone appears both on carrier sites and in Apple’s own store. In the U.K., for example, Apple is advertising the 8 GB model for £429.00 (USD $712), or £40 cheaper than the 16 GB version. The only difference in the new phone is the internal storage, which is capped at 8 GB, compared to the older 16 and 32 GB models. With less space to store data, photos and apps, the phone is accordingly priced lower and will likely appeal to customers on a budget. 9to5Mac reported Monday that Apple was planning such a phone and suggests the move by Apple is due to disappointing sales of the current iPhone 5c models. Although Apple hasn’t broken out sales of the lower-priced handset, it has been widely believed since October that the iPhone 5c isn’t selling well compared to the new iPhone 5s. 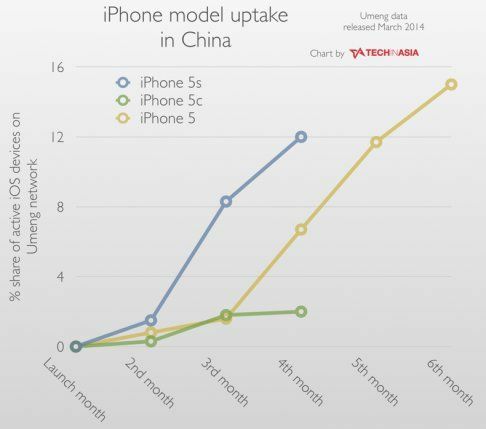 And a recent analyst report from China’s Umeng, found by Cult of Mac, suggests the iPhone 5s widely outselling its less expensive counterpart in that country. While it makes sense to me that Apple is looking to expand affordability of its phones and appeal to those who may opt for a less-expensive Android(s goog) or Windows Phone(s msft), an 8 GB edition of the iPhone 5c surprises me. The internals of the iPhone 5c are the same as the prior year’s iPhone 5, so the handset is quite capable; it’s not a budget piece of hardware. A perfect example is the camera sensor, which takes excellent high-resolution photos and 1080p video, both of which can quickly eat up large chunks of storage capacity. Add in some of the latest games that the iPhone 5c can play well — some of which can easily take up 1 GB of storage alone — and you can see the challenge owners of an 8 GB iPhone 5c could have. The same constraints appear in the 8 GB iPhone 4s as well, but there’s a key difference: That phone can be purchased in the U.K. for £349.00 and, with the £80.00 savings, may have more appeal than the new 8 GB iPhone 5c. 8 GB is just too little. They should reduce the price of the 16GB model. apple should just give up on 5c and bring back a 8Gb version of 5 as the cheaper model. it would sell like crazy, just as cheap 4’s and 4s’s sold well when the new models came out. apple should focus on lower specs for cheaper model but not compromise on the physical design. I’ve officially decided Tim Cook doesn’t know what the heck he’s doing and Apple is not going to gain a single percentage of global market share. I can see no reason whatsoever for anyone to save that little bit of money to get half the memory. Even as an Apple shareholder I can see Apple is trying to rip-off naive consumers and there’s no reason for Apple to do this sort of underhanded move to save their profit margins. The 5c is no bargain and a decrease in memory will only make it less so. Does Apple use some special memory that is higher quality than everyone else out there? There were people who used to talk about Apple’s huge economies of scale but this only shows that Apple doesn’t have much of advantage. Apple seems to be charging far more for memory than it needs to compared to other smartphone manufacturers.